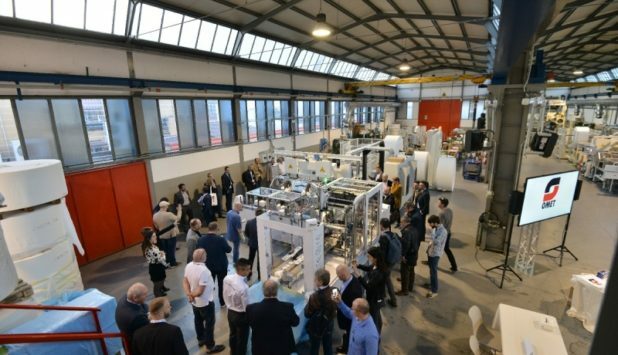 The “OMET Folding Experience” open house closes with great success, big turnout and memorable demos on the machines: more than one hundred people visited the OMET factories in Lecco and Valmadrera (Italy), transferred by shuttle from the Tissue World fair in Milan, taking the opportunity to see the OMET machines for the tissue industry. At the Lecco plant, guests were astonished by the high technology of the new TV840 Tronic, high performance automatic line for napkins with 5 printing units allowing rapid job changeover and automatic register set-up: completely regulated from the operator panel, it’s the most technological machine on the market. The servomotors and the cameras on the line make the whole production process extremely simple, without need of any manual intervention. OMET answered to the growing interest in digital technology with the TV503 line equipped with the Chameleon variable data inkjet digital printing unit, a direct-print system able to receive files and print them directly onto the napkins using simple pdf, jpg or other common formats. Guests of the open house received personalized napkins printed with photos taken at their welcome at the factory, and saw several job changes. Simply by uploading digital files to the Chameleon unit software, the line was able to pass in a few seconds from printing photos to full background images with beautiful Italian landscapes, branded images or cartoons. The TV503 XP, single line for napkins with servo-motorized prints, was equipped with a point-to-point embossing unit printing in 3 colors: it showed a perfect point-to-point embossing at a speed of 550 meters per minute on 290 mm 2-ply napkins.